RT @thehealthrebel: and the listing of many croft buildings making them expensive to maintain and/or purchase! Can we use legislation to encourage more female crofting tenants? Re-defining crofting law politically or legally? S40A notice – are crofters complying with residency duty? Should have been done by Commission by April. Still to do. We now have microphones working – much clearer audio! “Ordinarily resident” taken in the round about what a crofters entire duties are. Do they have “settled purpose”. Ministerial direction in 2010 to take action for absentee cases over 10 years. Can take 18 to 24 months to process. Stages: Review, Proposal to Terminate, Advertise proposal to terminate, Terminate tenancy. RT @culcairn: should never be a 2 year process. Undermines confidence in act. Results: 300 crofts now have resident crofters. Either returning crofters or assignations. Residency easier to deal with than neglect #croftinglaw Is it not better to tackle neglect than absenteeism where no neglect? Purchase of whole croft when sasine title. Need to be sure is whole croft or deed will be invalid. Can we divide a grazing share from the croft? Multiple owners – can we draw a line under the sand and take previous divisions as actual divisions? Removal of “cultivate by hired labour”. Why? What happens when you deviate from a Scheme for Development that has been granted? Advertising costs re. Crofting Register – could be £100 per advert x 2. Landlords receive no financial benefits from crofts. No incentive to create more or invest in them. RT @gemzmackenzie: @CroftingLaw might be worth writing a letter to FW summarising the key issues/pointers? The crofting bubble. Many Acts and consultations over the years. No one looked at social needs and integrate. Scrap the crofting Acts and start again. Review of whole policies to see what should be applied in Scotland or different areas. Local needs vary – policies may need to. Is starting from scratch codification? If Government not brave enough still need a clean slate re. 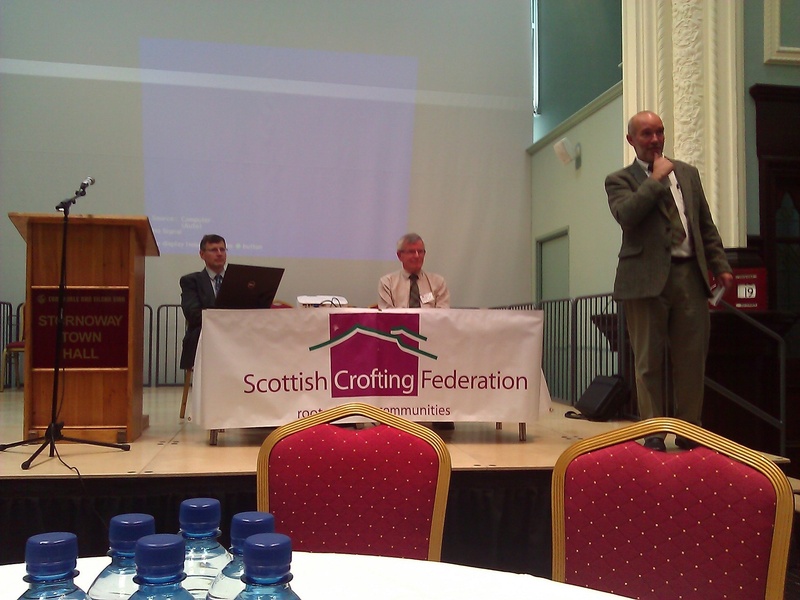 crofting Acts and policy objectives. Abolish the difference between owner/occupiers (crofters/non-crofters) and tenants. Same conditions whoever is in occupation. Ministers arrived in middle of this. Lawyers are major advisers. Simpler ways to deliver policy intentions necessary. Transparency of extent of land #croftinglaw But not grazings shares?! 12 evening events on Crofting register being run from Barra to Shetland by Registers of Scotland + attending Highland Shows. Suggest if first Registration in Land Register also do Crofting Register application at same time. Land Registration (Scotland) Act 2012 gets rid of overriding interests other than 3 types. Crofting will no longer be noted. No opportunity afforded by Commission to comment on other sides comments. Breach of natural justice. Recent case on whether part of a holding = croft. Needs to fall within definition in statute. Shetland croft boundary case being discussed. Interesting social history of case. #croftinglaw Yes… 101 productions! Court placed boundaries where in all the circumstances they considered them to be. Pairc Crofters case: Protection afforded to landowners. Human rights referred to. This entry was posted in Crofting Conference and tagged @CroftingLaw, absentees, Charlotte Coutts, Clean Slate, Crofting Commission, Crofting Law Conference, Crofting Law Group, Crofting Law Sump, David Barnes, Jim Hunter, Martin Corbett, Martin Minton, Registers of Scotland, Rob Gibson MSP, Scottish Government, Sir Crispin Agnew QC, Susan Walker, The Firm, WS Society on October 27, 2013 by Brian Inkster. 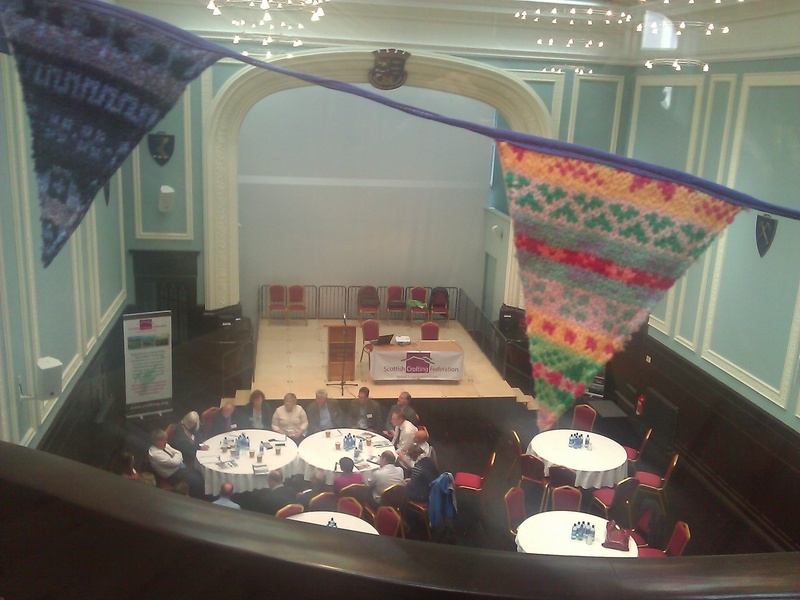 I was in Stornoway, Isle of Lewis, on 19 and 20 September 2013 for the Scottish Crofting Federation’s annual Gathering. The theme of this year’s crofting conference was Common Grazings: Utilising Potential. The conference was ably chaired by Derek Flyn and well organised by Patrick Krause and his staff from the Federation. A good and diverse range of speakers made for a very interesting and enjoyable conference. I am not, in this review, going to cover all the talks that were given but will focus on those that had a crofting law aspect as this is, after all, a crofting law blog. Paul Wheelhouse MSP, Minister for Environment and Climate Change, should have been the keynote speaker but parliamentary business detained him in Edinburgh and his place was taken by David Barnes, Deputy Director of Agriculture and Rural Development. David told us that the Crofting Commission has a focused not diminished role. Some, I would suggest, might argue with a focus in the wrong places! Over 80 new crofts have been created in the last 5 years. Mention was made of crofters being allowed to be absent with good cause. My experience does not bear this out. But then my view of good cause may be quite different from that held by the Crofting Commission. The Scottish Government were disappointed by the number of voluntary registrations on the Crofting Register. Not that surprising. Apart from a token discount for community registrations there was no real incentive to do it voluntarily. David Barnes referred to the “specific and acute problem” with the 2010 Act that created a flaw in decrofting procedures and resulted in the 2013 Act to remedy that. The Scottish Government were very aware indeed that this is far from being the only issue with crofting legislation. They will be carrying out a consultation later this year. They need to take their time. Owner-occupiers who are not owner-occupier crofters and cannot decroft without the consent of neighbouring landowners may take a different view about the need to take any more time over that particular issue. On the question of what form legislative reform might take David Barnes asked: “Do we look for where holes are and put patches on them or do we have a root and branch rewrite?” This question is one that is likely to tax MSPs in the coming months (or years perhaps depending on how much time will actually be taken over it). @HighlandLawyer @BrianInkster Hear! Hear! MSPs are in general a very bad influence on Acts of Parliament! My own view is that there are pressing issues that need be dealt with sooner rather than later and others where time can be taken. We may need at least two Bills: one within the next year (patching holes) and a more comprehensive one (possibly a rewrite) to follow in the fullness of time. Julia Aglionby from the Foundation for Common Land told us of some of the differences between Scotland and England & Wales. In England & Wales a shareholder is a commoner. In England & Wales all renewable payments go to the landowners and none to the commoners. Compare crofting shareholders in Scotland who receive 50% of those payments. Less than 5% of common grazings in Scotland are signed up to schemes to assist them. In England more than 80%. Why? We didn’t get any clear answers. John King of Registers of Scotland gave an update on the Crofting Register. There are 300,000 transactions that pass through Registers of Scotland each year before the new Register of Crofts is counted in. Professor Shucksmith recommended a map based Crofting Register and that is what we now have. The Crofting Register is free to view online. 29 common grazings have been registered on the Crofting Register to date. This is much better than I ever expected by this early stage. 9 crofts have been registered to date. Most with plans produced by crofters themselves. Registers of Scotland can help by providing crofters with OS maps to plot their croft on. Derek Flyn referred to Registers of Scotland having been user friendly with the Crofting Register. Alister Danter of Business Gateway discussed management structures for crofting communities and mentioned the possibility of crowdfunding. Iain Maciver from Community Land Scotland told us that freehold land is often favoured over common grazings for development because of crofting issues that arise. Soumings are now relevant more than they were in the past when renewable developments take place on common grazings. Whilst we were in Stornoway Town Hall other crofting activities were taking place around Lewis for the school children participating in Crofting Connections. The children also sat in on some of the sessions in the Town Hall. I enjoyed the Gathering and am already looking forward to next year’s one. This entry was posted in Common Grazings, Scotttish Crofting Federation and tagged absentees, Alister Danter, Business Gateway, Common Grazings, Community Land Scotland, Crofting Commission, Crofting Connections, Crofting Register, crowdfunding, David Barnes, Derek Flyn, Foundation for Common Land, Gathering, Iain Maciver, Isle of Lewis, John King, Julia Aglionby, MSPs, owner-occupier crofters, owner-occupiers, Patrick Krause, Paul Wheelhouse MSP, Registers of Scotland, Scottish Crofting Federation, Scottish Government, Shucksmith, Stornoway on October 9, 2013 by Brian Inkster.